parenting | Connect. Evolve. Thrive. I love giving books as baby presents. Long after the adorable onesies and outfits have been outgrown, the books remain. 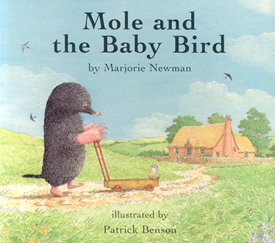 In addition to the twenty copies of Eric Carle’s The Very Hungry Caterpillar that we received when my son was born, we also got a copy of Mole and the Baby Bird– a beautiful story by Marjorie Newman. With a sweet narrative and gentle drawings, Newman and illustrator Patrick Benson tell the story of young mole who finds an abandoned baby bird and adopts it. Mole responsibly cares for his pet bird despite the admonitions of his parents that it is not a pet bird, but a wild one. When the bird begins to fly, Mole builds a cage for it, not wanting it to fly away. The bird is sad. Mole is sad and his parents are sad. His parents tell him the bird should be free. The story can clearly be understood as an object lesson in “If you love someone, set them free.” But I think there is a more subtle lesson in the book- and one that is important for parents, friends, teachers, and coaches alike. Mole cannot hear what his parents tell him. It is not real for him and he cannot quite get out of his own perspective and find another way of viewing the situation. It is mole’s grandfather who, without saying a word about the baby bird, is able to help Mole do the right thing. By allowing Mole to experience what it means to be a bird, Mole’s grandfather lets Mole come to the realization himself. It is only when Mole is empowered to discover things on his own, that he is able to grow. Too often as parents we want to protect our children. As friends, we are often convinced of the right way of doing things. As teachers we want to instruct our students in the correct way to learn. And sometimes as coaches we have wishes for our clients. We want to tell these people that we care for the right way to do things and keep them from feeling hurt or pain. We want to teach them the lessons where it is safe. But when we do this, we deny them the opportunity to learn it for themselves. In the story, Mole’s grandfather takes Mole on a journey of self-discovery. He allows Mole to experience the world and come to his own conclusions. In the end, Mole makes a painful and difficult decision. But it is his decision. There will not be a book focusing on Mole the adolescent or young adult complaining to his therapist that his parents made him set the bird free and that he has been resentful ever since. Mole will grow up knowing he owned his choices- however difficult they may have been- and he will be a better adult mole for it (or so I imagine). We must learn to support our children, friends, students and clients on their journeys- helping them see their own potential and find their own paths. It is not always easy- but if we love them, we must set them free. I remember the day it began- because of course you never forget. And the odd thing about those days is that you don’t realize when you wake up that it will be a day that changes your life. When you wake up it is just a day. It is a Monday or a Wednesday. It’s just a day. For me it was Sunday. It started with a birthday party for a friend’s toddler. It started by watching my three year old son playing and showing off my ten week old daughter. After all the excitement my son was tired. Like I always did, I went to put him down for a nap. I snuggled him as he drifted off to sleep. Or rather, he should have drifted off to sleep. Instead he began twitching his hand in mine and then he was shaking rhythmically in my arms. And I didn’t know it as I screamed for help, as I waited for the ambulance, as I watched helplessly while he seized, that it had begun. I didn’t know about the hospital stays, the sleep deprived EEG’s, the med evac flights, the doctor’s visits, the meds, the side effects, the IEP’s, the sleep studies and all the other parts of parenting a child with epilepsy. At that moment I only knew that my baby was sick and that I couldn’t help him. But it had begun. That day changed the trajectory of our lives. I found strength I did not know I had. I learned (slowly) that whatever expert I met, I was still the expert on my son and that I needed to stand up for what I felt in my heart to be right. 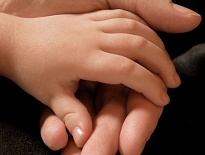 I learned that parenting a child with a serious illness is a marathon and not a sprint. I learned that there are good days and bad days and though the good days often outnumber the bad, the bad ones can be so bad that they leave you reeling. I learned that asking for help on those bad days is the only way to survive it. I also learned that people can get used to anything. The medication regimen that once seemed so difficult to coordinate became routine and the schedules that once overwhelmed us became second nature. It all just became the new normal, such that some days I forgot what it was ever like before it all began. But it’s not the same as it was before it began. I and my family were changed and marked by that day and the ones that followed. We were altered in ways mundane and meaningful. I am a better mother and advocate now than I was on that day- not that I was bad before or that I wanted to learn in the way that I did. Life happened on that day. I can mark the before and the after. I also know that there will be other befores and afters- hopefully less traumatic than that one. Every morning I wake up, life can happen to me. And I know now I can survive it. As another winter storm bears down on New England, I engage in my pre-storm ritual: obsessively reading weather reports and blogs. I love weather. I love storm watching. I feel (despite much evidence to the contrary) that if I read everything I will know what the future holds. I will be able to predict what will happen and where. I will be prepared. Of course, I am not. Meteorology may be a science but it is clearly not an exact one. Every storm teaches me that the future is unknowable, and therefore uncontrollable. My constant reading aside, the weather will do what it plans to do. Rain/snow lines will shift, low pressure systems will unexpectedly move in and my day will be affected in ways I hadn’t planned. In short, the weather is just another area of my life over which I have very little control. The career I planned in my twenties is very different than the one I have now. The marriage I imagined as a child bears little resemblance to the one in which I happily find myself. The beautiful children I have today are very different than the ones I daydreamed about as I held my hand over my swollen belly all those years ago. What happened? Life. All the preparation in the world, all the good advice, all the self-help and parenting books, could not prepare me for the ways that life intervened. I could not have predicted the ways that love, economics, ambition, violence and illness would affect the trajectory of my life. All the reading and planning could not have prepared me for the ways in which life would alter and change me- shifting priorities, values and beliefs. Control is an illusion.What mattered more along the way was knowing myself and being open to learning more.When life challenged me, my willingness to adjust, go with the flow and when needed, set limits, allowed me to grow as a person- to not only survive, but thrive. We focus a lot in our society on being prepared. And preparation is important. Too often though, we focus on the wrong kind of preparation. We prepare for life’s storms never realizing that forecasts change and that the storm we prepared for is seldom the storm that arrives. We cling to dogma and ideas about the way things should be instead of looking within to build strength to find our own truths. What I have learned is that flexibility and humility are my lifelines; knowing what I can and cannot control and learning to ask for help when I am tossed in the waves of life’s hurricanes. I suppose that I like to watch storms because it provides me with an illusion of control. But I know now it is an illusion. I know that I can no more control the storms of my life than the storms in the Gulf Stream. But with the weather I can pretend. So, today I’ll buy the loaf of bread and the gallon of milk and enjoy watching the storm, if and when it hits.